This web map compares Pre and Post fire, 3m resolution satellite imagery, of the of the Pigeon Valley Fire 2019, Nelson area. The imagery uses the the near-infrared band. Using this display helps the burnt areas stand out to the naked eye. The deep red colour represents healthy forest vegetation. Dark grey/blackish areas are those burned by the fire. Pale pink areas are pasture. 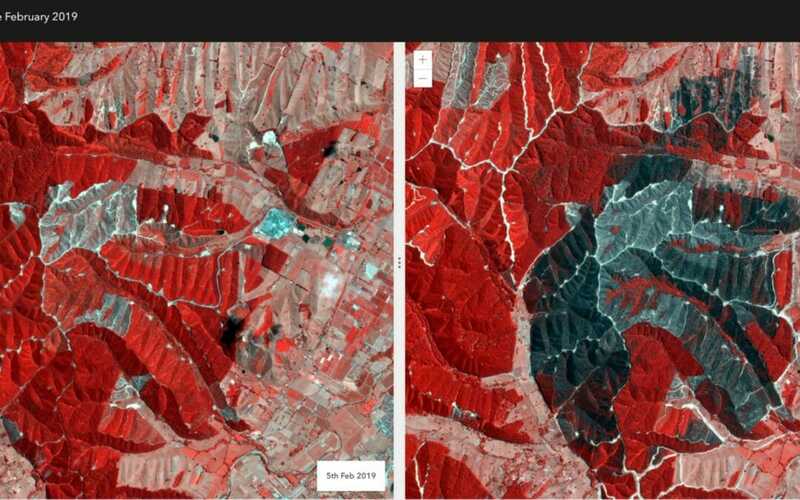 You can also see in the imagery comparison where the hard working ground staff had been constructing fire breaks (bulldozed tracks) since the fire started to stop it spreading. Please note: areas of forest where the base of the trees have been burnt, but the canopy was not touched by the fire, will not show in this imagery, as it represent surface reflectance only. Another great example of the imagery provided through our partnership with Planet Imagery (www.planet.com). If you would like to use or know more about Planet.com and its application across the forest industry, just reach out and touch base with our remote sensing team.